Virginia Rep’s “West Side Story” is a tour de force of talent and technical achievement | Theater | Style Weekly - Richmond, VA local news, arts, and events. Is there a more beautiful song in the American musical canon than "Somewhere," that classic cry of longing and hope for a better tomorrow? The Broadway landscape is littered with similar tunes, but has anyone ever bested "Somewhere"? The melody alone is enough to make you tear up. As you can probably gather from this introduction, "West Side Story" is likely my favorite musical. With Arthur Laurents' streetwise dialogue, soaring melodies from Leonard Bernstein, lyrics by then-young punk named Stephen Sondheim and conception, choreography and pretty much everything else by Jerome Robbins, "West Side" has rightfully held a place of honor in the Broadway repertoire since it debuted in 1957. There's something distinctly American about "West Side Story" – so much of our love, our passion and our prejudice is on full display in this musical of warring gangs in midcentury Manhattan. And as questions of immigration, travel bans and who is allowed to belong in our country continue to make the news, Virginia Repertory Theatre's staging of this classic work couldn't be timelier. From the opening number's high-flying acrobatics onward, it's clear that the theater company doesn't plan to waste this prized material. Helmed with an assured hand by the theater's artistic director, Nathaniel Shaw, this tale of gangs and doomed lovers is a tour de force of talent and technical achievement. First off, Matthew Couvillon's reproduction of Robbins' original choreography is some of the most impressive dancing I've seen in a Richmond theater. 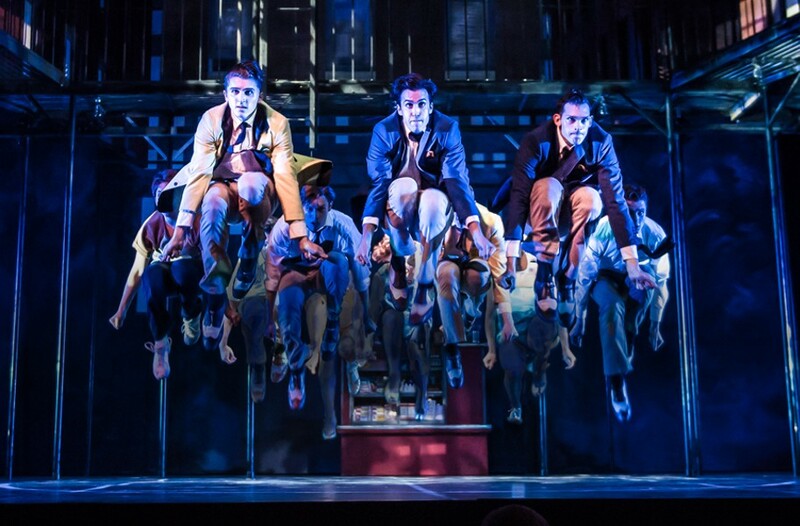 In big numbers like "Cool" the cast flies across the stage in an airborne ballet. Shaw also contributed some of the show's more playful musical staging on numbers like "I Feel Pretty." As Maria and Tony, Brittany Santos and Justin Luciano are charming together, singing beautifully in numbers like "One Hand, One Heart." Eddie Maldonado plays Bernardo, leader of the Puerto Rican Sharks gang, with machismo while still impressing with his voice and footwork. And as Bernardo's girlfriend Anita, Maria Cristina Slye delivers a fun and lively "America." In "The Dance at the Gym" number, the choreography, B.J. Wilkinson's frenetic lighting, Sarah Grady's colorful costumes and Anthony Smith's music direction all unite in a vibrant freak out that bears repeated viewings. Scott Bradley's urban scenic design looks like it was taken from an Edward Hopper painting: all clean lines, solid colors, light and shadow. The band, under Smith's direction, does jaw-dropping work with Bernstein's difficult music: It's an absolute thrill to hear his Latin- and jazz-tinted score played by a live, 11-piece ensemble. The white Jets gang, the Sharks, Doc, Lieutenant Schrank – all other elements of this retelling of "Romeo and Juliet" are faithfully rendered: "Somewhere" and the ballet surrounding it still fill us with longing. "Gee, Officer Krupke" and "America" still make us laugh. While the sound system occasionally ate some of the lines on opening night – in "America" in particular – this is a minor quibble. From its frenzied opening to its heart-wrenching conclusion, Virginia Rep has crafted a knockout of a show. Given the headlines of the day, there's a jolt of immediacy to this tale of the borders we erect and how they hurt us all. The present can be an ugly, fearful place to exist and sometimes the only thing you can do is hope this will all lead to a better somewhere. Virginia Repertory's "West Side Story" plays through July 29 at the November Theatre, 114 W. Broad St. For information, visit va-rep.org or call 282-2620.